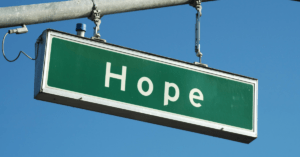 We don’t really use this word – HOPE – too much, anymore. I mean, we might hope to get into this school, or hope we land that job, or hope our health improves, or hope we meet that perfect person. We’re relatively comfortable now, advancements in modern technology have eliminated most sources of suffering. If I’m cold, I turn on the heat. If I’m hungry, I head to the fridge. If I’m sad, I take a pill. If I’m lonely, I check my new feed … again. But when my world is hit with something I can’t “fix,” then I call to mind this idea of HOPE. I was forced to think about this concept when my teenage daughter was almost killed in a car accident. So many things were outside my control. Well, actually everything was outside my control, expect me. That first lonely night I sat at her bedside begging God to let her live. But in a all-too-familiar conversation, I knew that God owed me nothing. I also knew that preserving her life was not the measure of His love for me. God let’s those He loves die everyday. I learned this watching my mother die, now I had to revisit it – this persistent concept of “letting go.” It is an irritating and aggravating concept, and one that does not go away. HOPE, is the reality, that no matter what happens to me, or those I love … there is something more waiting for me and them. Something that will not disappoint me, something that is true. A place where there will be no more crying or fretting or illness or sorrow. A place where all will be well. I do not say this flippantly, as I have experienced many sorrows, and many losses. Through these experiences I have been confronted with the truth, that, no matter what happens while I live, I will not be overcome. I may not get what I pray for, but I will not be overcome. Not an idea that makes me happy-clappy, but this is HOPE, the anchor of my soul. HOPE is a thing, a noun. It is more than a feeling or an expectation. HOPE is a reality. Threadbare Words is a series of pieces exploring thin, worn-out words. The idea is to examine their real meaning, consider their overuse and, finally take a fresh look at them through the filter of a 21st century mind to discern if they’re still relevant. Join the dailyPAX community – help for the weary, worried, and restless. Want a stronger faith? There’s no app for that! I know that hope is more than we give it credit for, but this was beautifully put. I have often been at these doors and usually count my faith as the thing that gets me through, but it is the hope of things to come and things not yet seen. Thank you for this series. It is lovely when we meet people who “get” this type of hope. I have a deep sadness in my heart for those who do not know it. It isn’t a consolation when things go bad, it is a beautiful truth that we should remember even when things are good. I love this, Lisa. I often think that in our “hopeless” world we need to have a new word…and it’s a tag I use sometimes. “hopemore”. We need more of this, not less. We need people to put it out there, as you have. Thank you. #hopemore I love this!! Thanks for the idea Crystal.